It is located in a residential area at the intersection of traditional Belgrano and Sarmiento streets, a few blocks from the main commercial city, casino and most renowned gastronomic centers of the province, and Aristides Sarmiento streets Villanueva . The Plumerillo International Airport is 10 minutes by car. The hotel has private parking and car rental service. 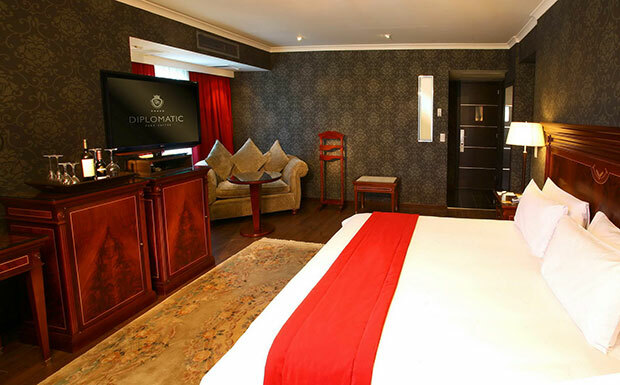 Diplomatic positions as "The Luxury Hotel Mendoza", founded in exquisite detail involving elegance and class, both for its impressive structure and its refined services. It has an innovative space called Wine Tasting, where complimentary daily guests may have their first contact with Mendoza wines also enjoy tapas prepared by the chef of the restaurant. 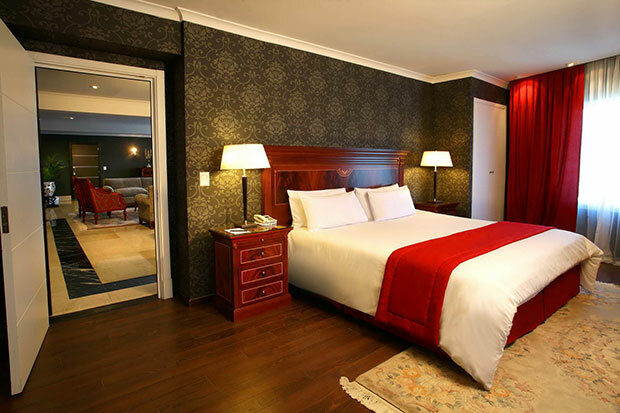 Diplomatic Hotel has 178 rooms on 19 floors, its impressive architecture is built in one of the most renowned areas of the city of Mendoza. 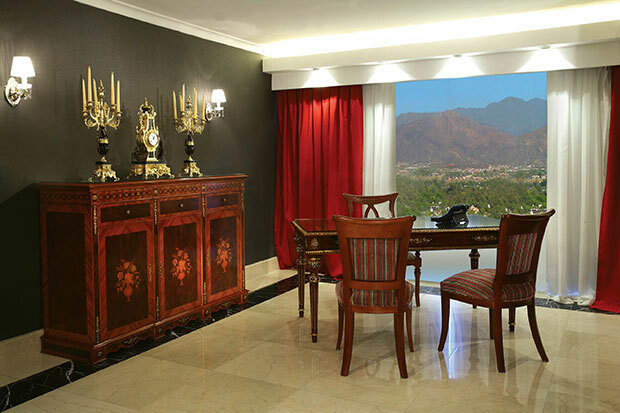 In this way its strategic location gives the best view of both the Andes and the City. 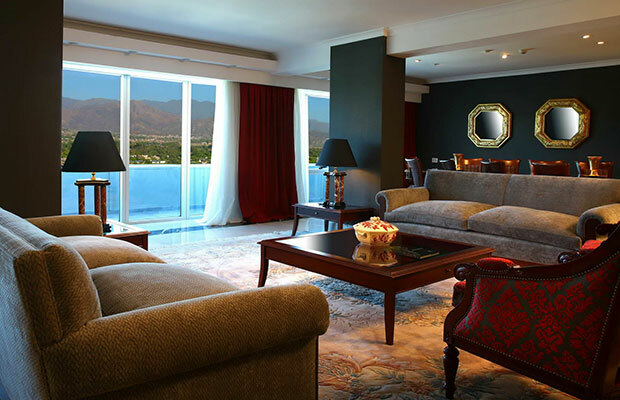 The elegant rooms of 39 m2, with panoramic views of the city of Mendoza. Sleeps 2: Double or twin. Optional double / double for family (up to 4 people). • LCD Display 32 "
• Large bathroom with fine finishes in different type of marble soaking tub and individual shower, hair dryer, magnifying mirror and telephone. The restaurant of Diplomatic included in your menu the best Mediterranean cuisine of Mendoza, where executive chef delights the most discerning customers. 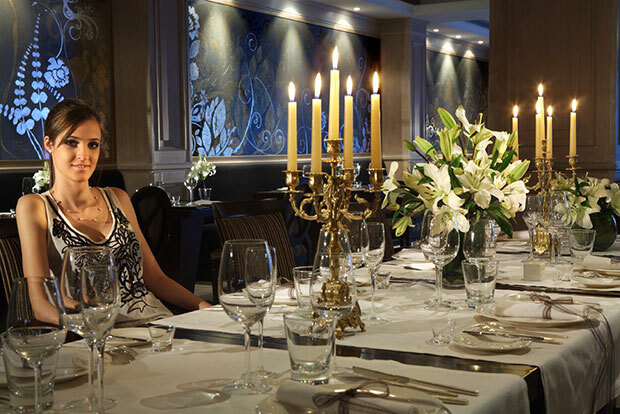 A warm and refined atmosphere is the ideal setting to enjoy the exquisite cuisine that combines the best techniques and the most prominent regional products. It is designed to enjoy an atmosphere of relaxation and tranquility, prioritizing pampering and relaxation. Give a modern and innovative space for exercise, developed into a very personalized environment. It has a pool that offers spectacular views of the Andes. This unique space offers a range of relaxing massages and energizing to recover from the fatigue and stress of modern life. In turn, the fitness center features the latest technology in their facilities since the entire set of equipment and the same are Techno gym machines, a leading brand in the international market and unique in Mendoza Province.